Four Hundred Years of Blood, Sweat & Tears! The truth of the matter is that our culinary heritage is not all that pretty. After all, millions of Africans were enslaved to work on sugar plantations to satisfy the European craving for sweets. Indeed, the burgeoning sugar industry from about 1550 on, was one of the great forces behind the expansion of slavery and helped ease the introduction of such slave labor to the cotton plantations of the American colonies. In the homes of the well-to-do throughout the American South, the cooking was done by slaves, primarily women. So, it is a fact that, at one time, black women formed the largest body of professional cooks in America. Many were not only proficient, but skilled culinary artisans. Therefore, appropriate names for many of our finest colonial recipes that have endured the tests of age and taste, might more accurately be "Old Ebba's Lemon Chess Pie", etc., than "Charleston This" or "Elegant That". Not only were the "receipt books" of those days filled with the delicious, but also chocked full of ingenious household hints related to dying homespun, food preservation, making paint, tree cultivation, cures for "auges & fevers", how to wash silk stockings or get rid of the bugs that plagued even the most elegant plantations. 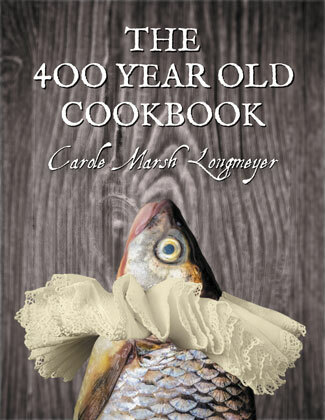 With courage and confidence, even in desperation, and often despite resources, our foregourmets, including homesick Elizabethans and resourceful Algonkians, made endless creative culinary contributions which endure-deliciously so!-a mere 400 hungry years later!